Our 3rd team get the headlines this week having assured themselves of promotion as champions in Division J. A comprehensive win against Bramcote and the news that nearest rivals Keyworth had lost at Clifton means they take an unassailable lead into their final game of the season. There were also wins for the 2nds and 4ths, which took them a step nearer to promotion, but more disappointment for the 1sts who went down to Welbeck. In the NPL the 1sts were in need of a win to move themselves off the bottom of the table. Batting first we were all out for 193 in the final over with Dominic Harvey remaining unbeaten with an excellent 61. Stand in skipper Matt Cross was also amongst the runs with 40. However Welbeck always looked in control as they secured a 6 wicket win with just 8 balls to spare. With Ordsall Bridon winning and Farnsfield securing a losing draw the 1sts lose ground on their nearest rivals at the foot of the NPL. assurance about the reply with a six wicket win being secured with more than 13 overs to spare. To be mathematically certain of promotion the 2nds now need just 4 points from their remaining two games to make it three promotions in three years. trouncing of previously in-form Bramcote. Batting first we made 227 for 6 wickets with Charlie Smith falling to a stunning catch on the boundary after reaching 90. The visitors were never in the hunt as they collapsed to 65 all out with Arjun Sandhu claiming 3 wickets. The full 20m points for the 3rds combined with just 5 points for neatest rivals Keyworth at Clifton gave the team a 54 point lead with just one game to come. back: James Grenfell, Matt Ahluwalia, Mark Walsh, Arjun Sandhu, Nick Anderson-Pearce, Gordon Brookes (umpire); George Barker, Sam Henson, Matt Hubbard, Sam Randall (captain), Matt Shaw, Charlie Smith, Will Barker (scorer). Thanks to Karen Barker for this and most of the other pictures published here. 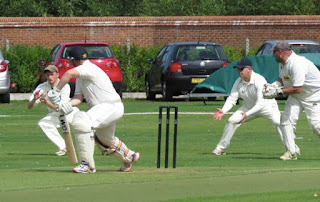 In Division M the 4ths are battling it out with Collingham and Farndon for promotion but there were no slip ups at East Bridgford as they secured a 6 wicket win. Juniors Finlay Meakin and Reece Caine both claimed a brace for 30 runs as the home side struggled to 155 for 8 in their reduced 40 overs. It was then left to some of the more senior members of the side to knock off the runs. Josh Knight with 42 and Carl Knight and Dave Harris each with 36 guided us past the target with more than 6 overs to spare. With just one game to go there is only 9 points between the top three. Farndon are 8 points above Collingham who have a one point advantage over Attenborough. Our final game, wouldn't you just know it, is against Farndon on Long Lane - plenty to play for there!